Intrepid Control Systems » Automotive Ethernet Tools Automotive Ethernet Tools | Intrepid Control Systems, Inc.
Hit the ground running with Intrepid’s full line of Automotive Ethernet tools! Automotive Ethernet (AE) represents the latest challenge to the status quo in automotive networking. Many OEMs are now moving forward with this exciting new technology, which promises high performance at low cost, especially for infotainment applications. Automotive Ethernet traffic cannot be monitored using the same techniques employed for buses like CAN. Ethernet networks use star topology, so there is no single point to monitor an entire network. The sophisticated technology employed also means bit values cannot be interpreted directly from voltage levels. Finally, Ethernet hardware silently discards erroneous frames, making diagnosing problem conditions difficult. Intrepid’s tools are designed to address all of these issues conveniently and efficiently. Intrepid’s RAD-Galaxy is a multi-purpose Ethernet multi active-tap, media converter and ISO CAN FD tool for Automotive Ethernet applications. Using the RAD-Galaxy, you can monitor both sides of up to 6 BroadR-Reach® (100BASE-T1 compatible) links in active tap mode, or connect your laptop to up to 12 nodes in media converter mode. In addition to supporting Automotive Ethernet, the RAD-Galaxy supports 8 ISO CAN FD networks, 1 LIN channel and a Diagnostics over IP (DoIP) channel. Intrepid’s RAD-Star 2 is a multi-purpose, dual Ethernet gateway for Automotive Ethernet applications. Using the RAD-Star 2, you can monitor both sides of a BroadR-Reach® (100BASE-T1 compatible) connection or connect your laptop to 2 nodes in media converter mode. 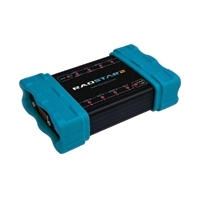 As a gateway to standard 8-wire Gigabit Ethernet, RAD-Star 2 makes any existing standard Ethernet device, laptop, or data logger compatible with BroadR-Reach® (100BASE-T1 compatible). The inexpensive, pocket-sized RAD-Moon easily interfaces conventional Ethernet with BroadR-Reach® (100BASE-T1 compatible). Powered by USB, the RAD-Moon allows you to communicate directly between a PC and an Automotive Ethernet ECU. Intrepid’s Vehicle Spy 3 software now analyzes and saves Automotive Ethernet data. You can view CAN, LIN, Automotive Ethernet and video data on one screen, time-aligned with an accuracy of 10 ns. Examine live data and load data logger captures to see when a test operator pressed a trigger button, synchronized with video frame captures and Automotive Ethernet frames. Your go-to reference book for Automotive Ethernet. This expansive volume explains how industry-standard Ethernet technology has been adapted via Broadcom’s new BroadR-Reach® standard to bring Ethernet hardware, and applications that run upon it, to the automotive world. Includes foreword by Bob Metcalfe, inventor of Ethernet. Intrepid’s Ethernet EVB is the ideal way to learn all about Automotive Ethernet. Equipped with two scriptable BroadR-Reach nodes, this package comes with Intrepid’s acclaimed Automotive Ethernet book and a lab manual full of hands-on tutorials to get you up to speed fast!